Moving from a family home into university halls is a hugely memorable time for anyone. I remember a mixture of emotions all at the same time. I was apprehensive, anxious and overwhelmed – but most of all excited. Any feelings of worry didn’t last long thanks to the welcoming team that greeted me at my halls of residence, Liberty House. Knowing that my new flatmates were all experiencing the same thing also made things less nerve-wracking. Moving all my belongings which had travelled with me from Bath into my room was uncomplicated and didn’t take much time at all. I brought up some cushions and blankets from my old bedroom to make it cosy, which helped the settling in process. 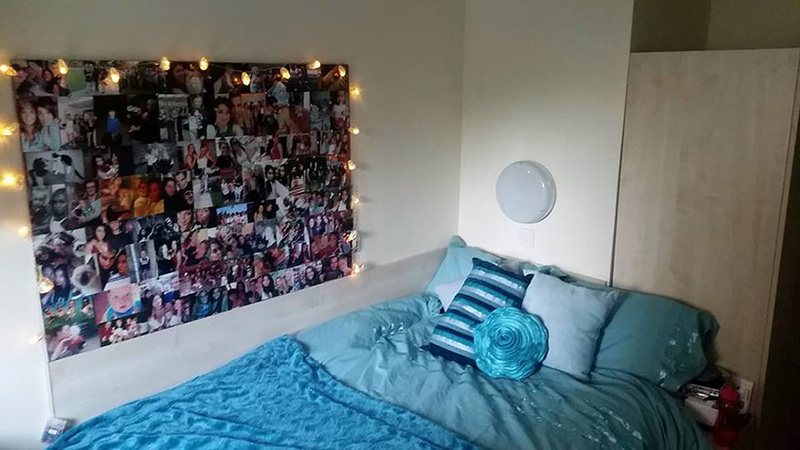 My room – I loved the pinboard and stuck loads of pics of friends and family up on it. The best part of the bedrooms in halls is the pin board, which is great for putting up photos of family and friends. The desk meant that I could escape to my room to study if I needed to, but to be honest I spent most of my waking hours in the shared living area. Here there was always something going on, and there was never a lonely moment. This is probably the most beneficial aspect of halls- it was so easy to make friends even if you didn’t share same interests. The location of the accommodation was ideal. Although campus and town were walking distance, there was a bus stop right outside too. The shops were local too, and we could do our bread/milk run in roughly 15 minutes! Another bonus of communal living is that the chores have to be shared too! We alternated each week on who was on bin duty – probably the most unpleasant job out of them all, but needs to be done right?! Cleaning the kitchen and living area was also a team effort – when everyone is responsible for doing a little bit it makes it just that little bit simpler. Some nights we would buddy up and cook dinners together too, saving time, effort and money! 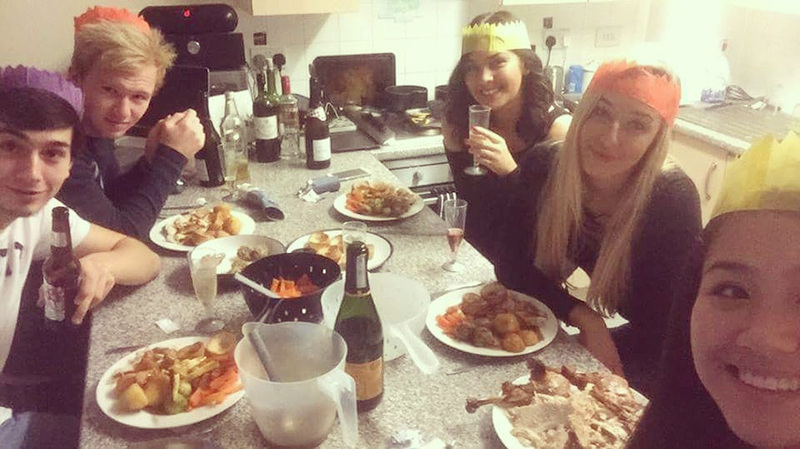 We even had Christmas Dinner – who says students can’t cook?! Occasionally when we were feeling lazy we had flat takeaway nights, which was my favourite thing to do – especially when the weather isn’t so great. 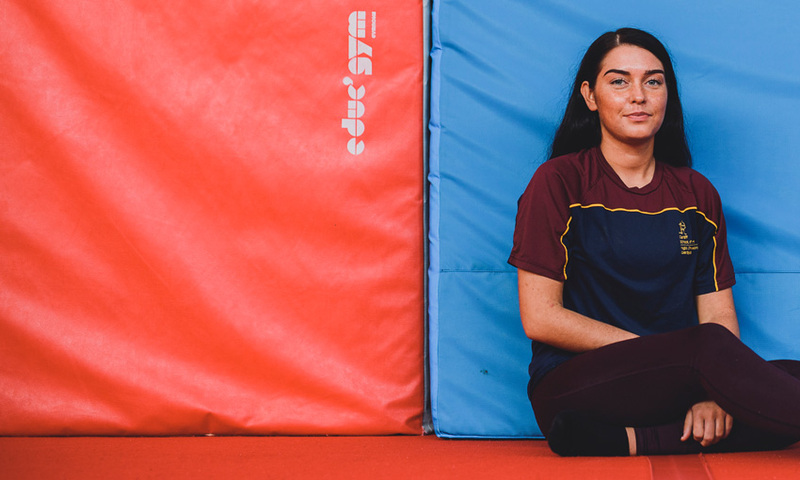 Even though when you start university you gain a lot more independence, the maintenance and reception team on campus are incredibly attentive and helpful for any issues you may encounter. There is also a security team who work 24/7 to ensure that everything is safe. My year in halls was undoubtedly one of the best of my life, and I would recommend it to anyone! It is a big part of the university experience which cannot be missed. Your first year will fly by so enjoy it while you can! Looking for more on living in halls? Check out our other blog posts, and watch a video about living on campus below.